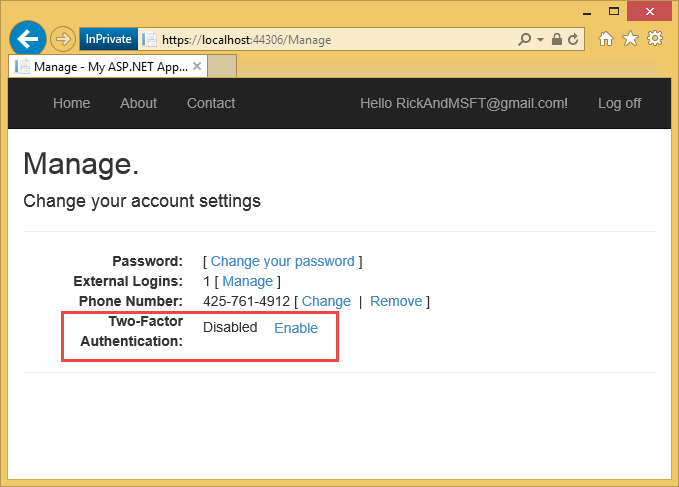 This tutorial shows you how to build an ASP.NET MVC 5 web app with Two-Factor Authentication. 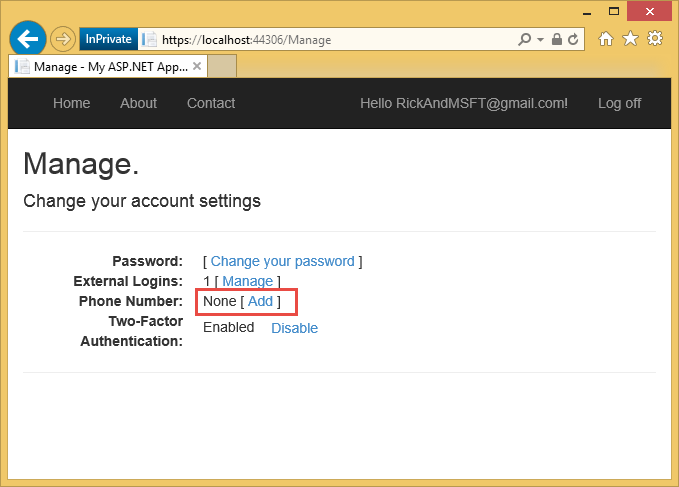 You should complete Create a secure ASP.NET MVC 5 web app with log in, email confirmation and password reset before proceeding. You can download the completed application here. The download contains debugging helpers that let you test email confirmation and SMS without setting up an email or SMS provider. This tutorial was written by Rick Anderson ( Twitter: @RickAndMSFT ). Start by installing and running Visual Studio Express 2013 for Web or Visual Studio 2013. Install Visual Studio 2013 Update 3 or higher. Warning: You should complete Create a secure ASP.NET MVC 5 web app with log in, email confirmation and password reset before proceeding. You must install Visual Studio 2013 Update 3 or higher to complete this tutorial. Create a new ASP.NET Web project and select the MVC template. 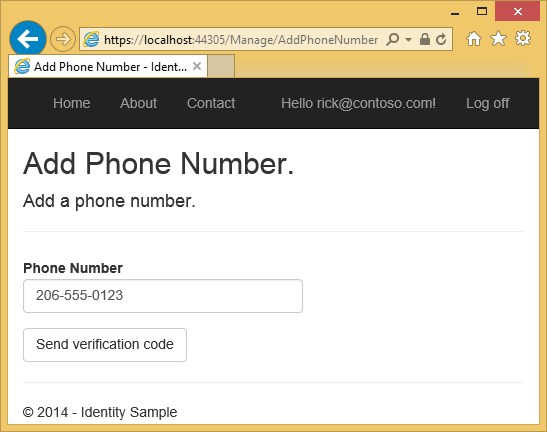 Web Forms also supports ASP.NET Identity, so you could follow similar steps in a web forms app. Leave the default authentication as Individual User Accounts. If you'd like to host the app in Azure, leave the check box checked. Later in the tutorial we will deploy to Azure. You can open an Azure account for free. Set the project to use SSL. This tutorial provides instructions for using either Twilio or ASPSMS but you can use any other SMS provider. Create a Twilio or an ASPSMS account. From the Dashboard tab of your Twilio account, copy the Account SID and Auth token. From your account settings, navigate to Userkey and copy it together with your self-defined Password. We will later store these values in the web.config file within the keys "SMSAccountIdentification" and "SMSAccountPassword" . From the Numbers tab, copy your Twilio phone number. Within the Unlock Originators Menu, unlock one or more Originators or choose an alphanumeric Originator (Not supported by all networks). We will later store this value in the web.config file within the key "SMSAccountFrom" . Make the credentials and sender phone number available to the app. To keep things simple we will store these values in the web.config file. When we deploy to Azure, we can store the values securely in the app settings section on the web site configure tab. Security - Never store sensitive data in your source code. The account and credentials are added to the code above to keep the sample simple. See Best practices for deploying passwords and other sensitive data to ASP.NET and Azure. 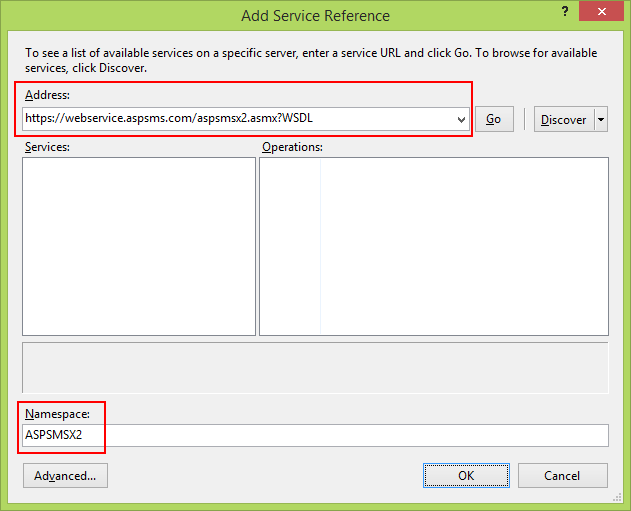 Configure the SmsService class in the App_Start\IdentityConfig.cs file. ////Twilio doesn't currently have an async API, so return success. Run the app and log in with the account you previously registered. Click on your User ID, which activates the Index action method in Manage controller. 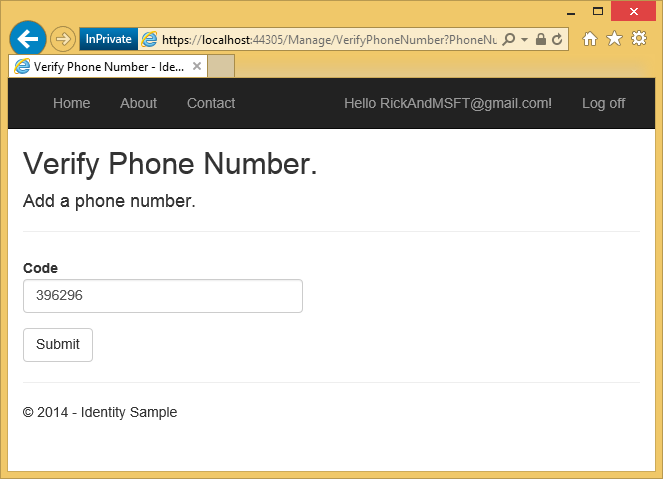 The AddPhoneNumber action method displays a dialog box to enter a phone number that can receive SMS messages. In a few seconds you will get a text message with the verification code. Enter it and press Submit. The Manage view shows your phone number was added. In the template generated app, you need to use the UI to enable two-factor authentication (2FA). To enable 2FA, click on your user ID (email alias) in the navigation bar. Logout, then log back in. If you've enabled email (see my previous tutorial), you can select the SMS or email for 2FA. 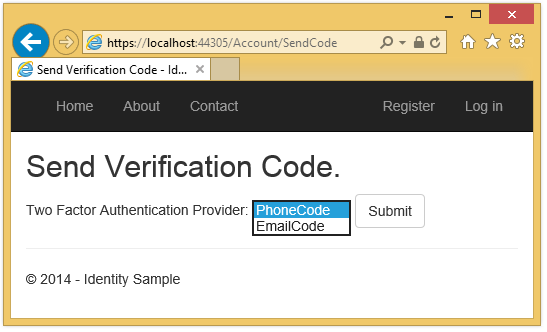 The Verify Code page is displayed where you can enter the code (from SMS or email). Clicking on the Remember this browser check box will exempt you from needing to use 2FA to log in when using the browser and device where you checked the box. As long as malicious users can't gain access to your device, enabling 2FA and clicking on the Remember this browser will provide you with convenient one step password access, while still retaining strong 2FA protection for all access from non-trusted devices. You can do this on any private device you regularly use. 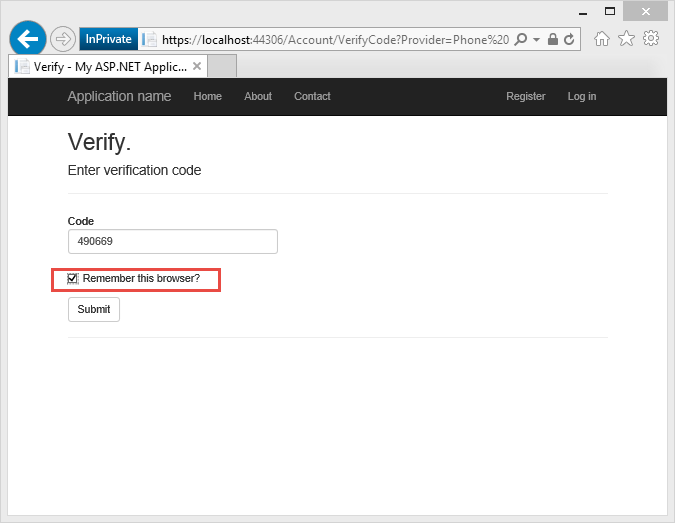 This tutorial provides a quick introduction to enabling 2FA on a new ASP.NET MVC app. 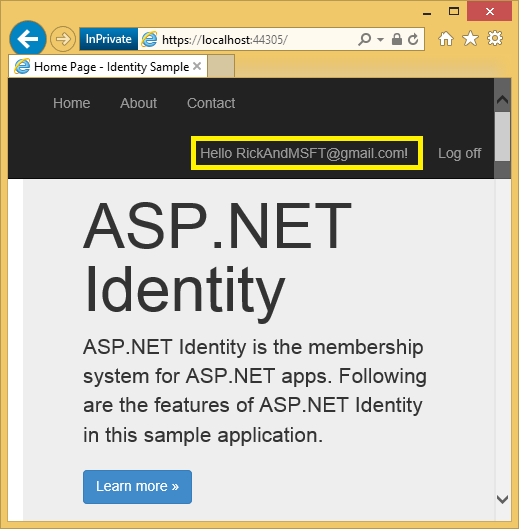 My tutorial Two-factor authentication using SMS and email with ASP.NET Identity goes into detail on the code behind the sample. Account Confirmation and Password Recovery with ASP.NET Identity Goes into more detail on password recovery and account confirmation. 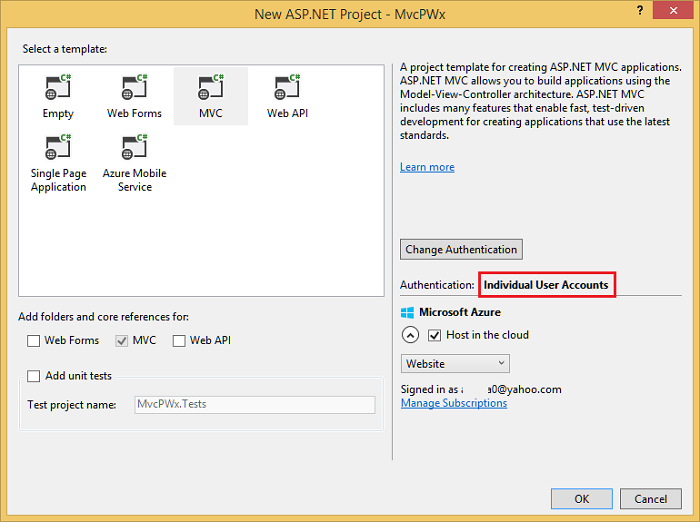 Deploy a Secure ASP.NET MVC app with Membership, OAuth, and SQL Database to Azure Web. This tutorial adds Azure deployment, how to secure your app with roles, how to use the membership API to add users and roles, and additional security features.